Justice and love don’t often go together but at least they’re now dating in Seattle Opera’s Fidelio. In Beethoven’s only opera oppression and tyranny take a back seat in a celebration of freedom and sewing. We took a behind-the-scenes tour of the costume shop at Seattle Opera costume shop with a delightful group: our friend Amy Wigstrom (we could listen to her sing all night long), now a development officer with SO, Susan Davis, the Costume Shop Manager, and newly on-board employee Brian Ramos, fresh from the Teutonic stronghold of Madison, Wisconsin. In Fidelio (running October 13 through 27, 2012), a devoted wife poses as a man to rescue her husband, who’s in a horrific jail for his conscience and beliefs. It was thrilling to see the original sketches of the costumes. I love sketches. They show the thoughts of the costume designers in motion. Quite often the costumes will evolve, but it’s always interesting to see where they began. Costume sketches are a form of art in themselves and we also got to see photos of individual actors wearing their costumes. The shop is a fascinating place, The sketches for the costumes are in Susan’s office on the wall. The workshop itself has garlands of photos of the photographed actors in costumes. It was so colorful and interesting to see Swiss maidens, Madame Butterfly, and French/Italian courtiers decorating the walls. Add in images from Nutcracker and you could hang the garlands on Christmas trees. We'd buy 'em. 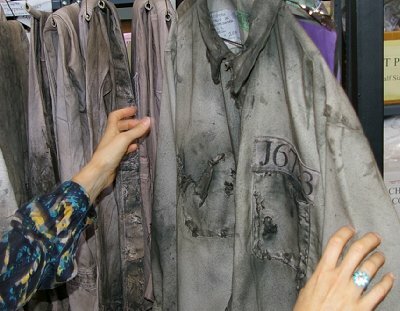 Susan showed us the finished prisoner uniforms for Fidelio. They started out like an artist’s naked canvas; indeed, these costumes began as standard white uniforms. Now, dyed, painted, and distressed on a grinder’s wheel, they looked ragged and like they had been worn constantly for years. The actors/singers come in at the appointed time and in one or two days, every actor is fitted for his/her costume. Fidelio has a large company. Earlier in September there were auditions for supernumeraries (“extras”) of all ages and walks of life to appear in the remarkable final scene of this powerful opera. 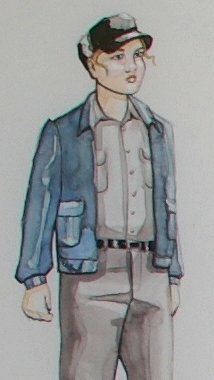 Seattle Opera and other opera companies either develop their own costumes, or rent existing costumes from other companies. Sets are rented in the same way. When Tacoma Opera mounted a production of Madame Butterfly, their set, designed by Carey Wong, was rented to other companies. Theater groups do the same things. 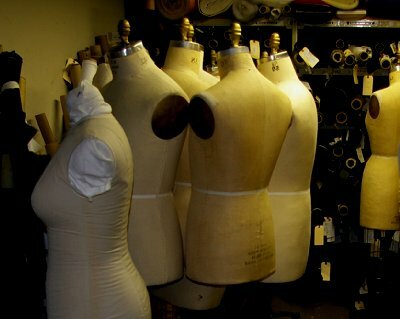 Seattle opera hires seamstresses, crafts people and a wig maker by the show. 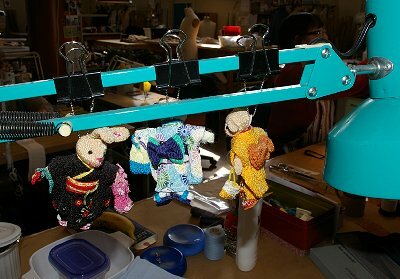 Just a few seamstresses were in the workroom when we toured but the bulk of the staff are hired as needed. Seattle Opera has used the same wig maker for years. She can rent, remodel or construct new wigs as needed. Wig making is an art, as is costume and set design and construction. Seattle Opera is holding a rare costume sale; this is the first in 10 years and only the 3rd sale in fifty years. High school and college drama departments love to come and pick up pieces for their actors. And so do people familiar with shows over the past decade. Many see the costumes as an art piece, or use them as a masquerade costume. The sale is at the Costume Shop from 10am to 4pm on October 20th at Seattle Opera (1020 John Street - Terry Street entrance). 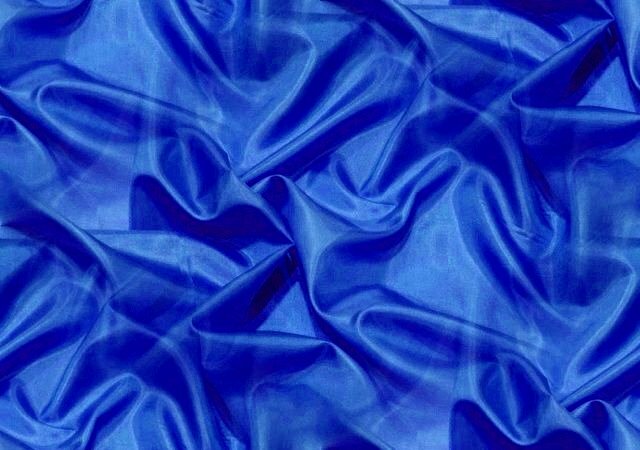 Susan Davis, the Costume Shop Manager added some enticing news about the sale, "We are having it jointly with the UW School of Drama costume shop, and I’m not sure what they are bringing. Our goods are odds and ends, lots of shoes (worn out, or just too peculiar to be useful in our general stock), some period costumes that are too worn or faded to use on stage, costumes that were made by other companies (from productions we’ve purchased over the years), and quite a few modern clothing pieces left over from various contemporary shows." The sale itself sounds like a lot of fun. Seattle Opera Costume Shop Tour, Fidelio at Seattle Opera, Seattle Opera, Seattle Opera Costumes, Seattle Opera Costume Shop Tour Seattle WA Washington.